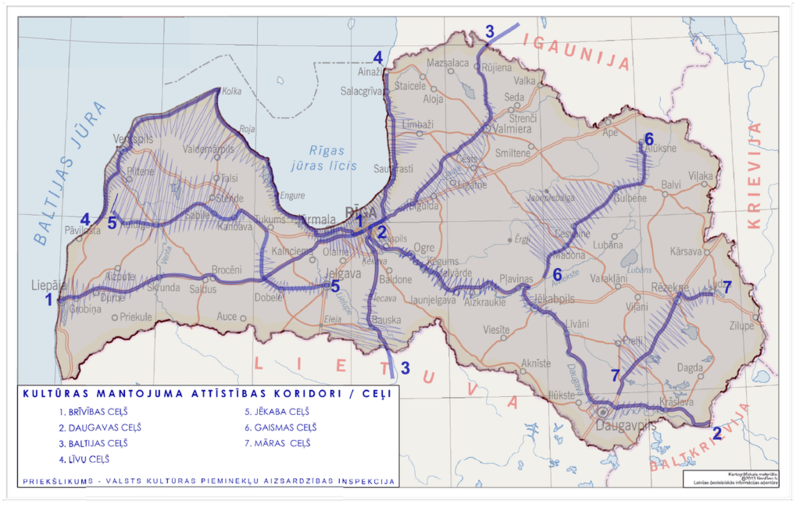 To learn about Latvia, take a trip along the seven paths to the idea of Latvian statehood - the Livs Road, Jacob's path, Freedom Road, the Baltic Way, the Path of the Daugava, the Path of Light, and Māra's Path. These journeys invite us to look back at the road to Latvian independence, to evaluate our current gains and resources, and to plan the future of Latvia together. They help us to understand the twists and turns of Latvian, history, the people, places, and events that facilitated the founding of the Latvian state and the creation of a Latvian identity by looking back at the distant past and remembering the national formations that have existed throughout the centuries in the territory of Latvia and have become a part of Latvia's cultural landscape. These are tourist routes filled with fascinating places, rich farmsteads, and beautiful landscapes. Created and done by: Latvian Country Tourism Association "Lauku ceļotājs"